Twice Cooked Pork (回鍋肉Hui Guo Rou) means cooked meat is returned to the pot to cook. 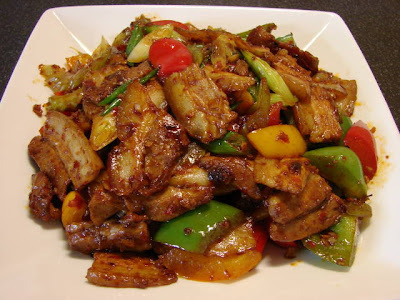 This tasty stir fried pork is probably one of the many well known Sichuan dishes. - There is another possible story relating to the traditional Chinese (not just Sichuanese) custom. When family visit graves to pray to their relatives, one of the offering is boiled pork. This pork is taken home later to eat as a blessing or they are too poor to waste any good meat. The meat is bland so Sichuanese used their local flavourings to make it tasty by slicing the pork then frying with chilli bean sauce, sweet bean sauce or hoisin sauce and other ingredients. It has then become a popular family recipe, every family may have their own preferred recipe. The cut of pork used also has different opinions. Some insist on using belly and some used shoulder pork or leg meat with skin and fat attached. I like pork belly myself. There are two typical recipes one similar to mine (with or without vegetables) and the other includes fried and sliced tofu with Chinese cabbage. Cover the pork in cold water and bring to a boil then turn the heat to minimum, put the lid on and simmer very gently for about 25 - 30 minutes. Remove any scum during boiling/poaching. Take the meat out, rinse and plunge in cold water to cool. Remove pork pat dry and cut into very thin slices. Heat the wok with a little oil till hot and fry the pork slices till the meat is lightly browned. Take the meat out of wok, set aside. See if there is enough oil (about 1 tbsp) left if not add a bit more, add garlic and ginger stir fry till fragrant then add chilli bean sauce and sweet bean sauce stir and then add the celery and sweet peppers. Stir fry till vegetables are slightly softened then add the meat back in and stir fry till the meat is well coated with the sauce. Add spring onion stir and ready to eat. **If you are not sure how much sauce you preferred add less first then after the meat is added, taste if you need more chilli bean and/or sweet bean sauce. Last time I had twice-cooked pork, I was at a Chinese restaurant in Nairobi, ha! Thanks for this. Really simple and you introduced me to pork belly.